To ensure your light clicks in to the socket correctly, it is very important to ensure installation of the nickel/brass socket nut is installed correctly. 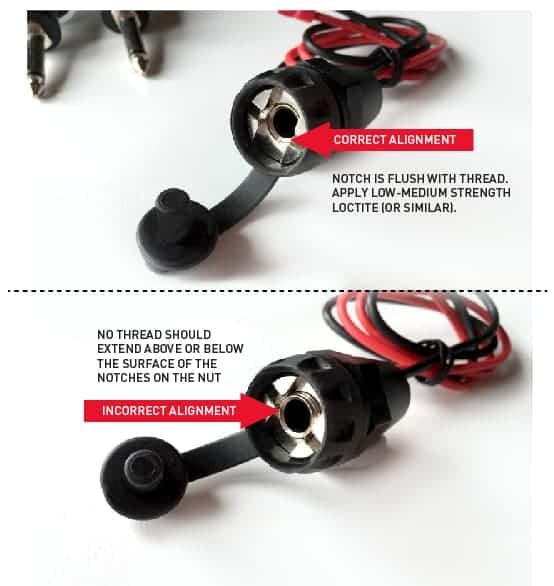 Use supplied nylon washer/spacers to ensure the lower surface of the locking nut’s notch ends up flush with the thread of the socket. Without this alignment the light will not fully engage with the retaining spring and may cause the light to fall out during your ride. If there is not enough thread showing then use hi grit sandpaper, dremmel tool or similar to reduce the thickness of plastic on your bike, working from the inside of the plastic to achieve the desired thread length. Finally, align the notch so that it is aligned horizontally and that the dust plug can be secured into the back of the light when clicked in. Apply a small amount of Loctite (Low – purple 222 or Medium – blue 243) to the thread and you’re done. Go anywhere knowing your bike complies with road rules and you won't be forking out big $$$ after a fall or swiping a tree.